I'm not sure where that ten years has gone, but back in 2008 Castletroy became the latest name on the Munster Schools Cup. In getting the better of CBC in that Dooradoyle final they became the tenth school - and first since St Munchin's in 1968 - to have a new name inscribed on the Senior Cup trophy. Maybe it's something about the figure 8, with Munchin's in '68, Castletroy in '08 and, just 12 months ago in 2018, Glenstal becoming the 11th and most recent name to adorn the coveted prize. The original trophy was presented to the Munster Branch by Sharman Crawford in 1909 to be competed for by the rugby-playing schools in the southern province. In 2009, to mark the competition's centenary, CEO of Munster rugby Garret Fitzgerald (cup winner himself with CBC in '71) donated a replacement cup, with the original finding a permanent resting place in the museum in Thomond Park. As coincidence would have it, that 2009 Centenary final between Christians and Rockwell was a repeat of the inaugural 1909 final between the same two schools - with the same outcome, as the cup made its way south to Cork. As the competition enters its 110th year, what can we expect for 2019? First up is a return to the system of old with what could best be described as a traditional knockout draw. The experimental double first-round backdoor system has been put on hold. It had its merits, not least in terms of ensuring two bites at the cherry. The new (or old, pending your perspective) draw has been put on hold. I am assured it is a temporary measure, with the immediate plan (presumably from 2020) to go to a Heineken Cup-type league as a qualifying system aimed at producing two post-Christmas competitions with eight going to the quarter-finals of the main cup and eight to a Mungret-style subsidiary or shadow tournament. The clear objective is to provide more competitive games and I don't think anyone can argue with that. The bottom line saw a temporary arrangement whereby debutants High School Clonmel faced the growing force that is Bandon Grammar (who won that game in the first-round) while Rockwell beat St Munchin's competing for the final place of eight in Round 2. The last of those four potential knockout ties I predict without a shred of confidence. However, all pre-competition evidence points to CBC and PBC marginally ahead of Crescent with both Glenstal and Bandon coming up on the rails. The clash of the round is unquestionably that of Crescent and Christians in Limerick. The winner of that will take some beating from there on, but with Pres and holders Glenstal looking the most likely. Looking into a very frosted crystal ball I'm going for Crescent, Ardscoil, Glenstal and PBC but I'll qualify that by saying that should Christians come away from Limerick with the win, I'm backing them to go the whole way. What it means is a wide-open cup in 2019. And if it is Christians or Pres to edge ahead in the Roll of Honour - they're currently tied at 29 apiece - they are going to have to do it the hard way. 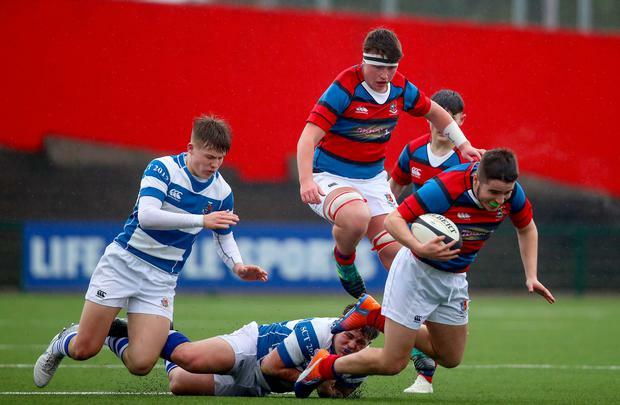 Glenstal, Bandon and possibly Ardscoil will have their backers but it is difficult to look beyond Crescent and the big Cork two at the top of the pile. Put simply that Crescent/CBC clash is massive and (though Pres might not agree) could be the final in all but name.